Why go to conferences… In which Sheila Pinchin offers a purely personal viewpoint of the CCME Conference (13) . Well, here I am at the Canadian Conference on Medical Education (CCME) in Quebec City, along with a great number of faculty from Queen’s, 15 meds students from Queen’s (some came up to volunteer!) Matt Simpson, Lynel Jackson from MEdTech and Andrew dos Santos from IT. As well, many staff are here (Kathy Bowes, and Jen Saunders), and our faithful Educational Team members, Eleni Katsoulas and Theresa Suart are here, too. Dean Richard Reznick, Associate Dean Tony Sanfilippo, Vice Dean Leslie Flynn, Associate Dean Ross Walker and Associate Dean Karen Smith are here. Suzanne Maranda, our head of Bracken Library is also here. And now I’m going to stop naming people as I know I’ll miss some. But these are just some of the people I’ve seen in the past day or two! I enjoy this conference so much! When I first started in Medical Education 7 years ago, I was one of the few, if not the only, Educational Developer at the conference. Now there are many more of us, and several Educational Researchers too. I don’t feel as odd, and I also feel more at home with all the faculty that come. And when you mix Ed Devs, clinical faculty, technologists and health education librarians together as we did in the workshop Lindsay Davidson, Lynel Jackson and I gave, you get powerful results! Flipped learning has never been so creative–thanks to Lynel’s wonderful graphics, and Lindsay’s really ingenious puzzle pieces activity! Networking is happening with our faculty here—Tony Sanfilippo and Hugh MacDonald got together with their counterparts from across the country, as did Andrea Winthrop and countless others who were in interest groups and business meetings. 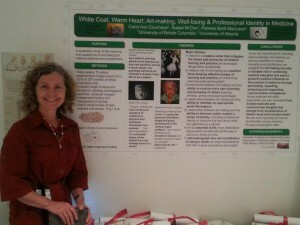 Many other faculty were involved in formal meetings and symposia. But informal networking has happened at mealtime breaks, and at other times, when you could see two or more heads bowed over computers or papers in the lobby and other places where you could sit. Memorably several people were sitting on the floor near the buffets– the better to be connected—to the electrical plugs in the wall and to each other, I presume. 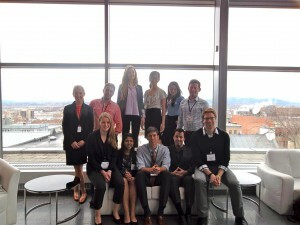 Tony Sanfilippo took advantage of the time to meet up with students as well as other faculty. Here he is bonding with meds student James Simpson over a bowl of rice pudding. And here’s Eve Purdy, conference volunteer par excellence, finding common ground with Dr. Dave Williams, keynote speaker, president and CEO of Southlake Regional Health Centre, and former astronaut. In addition to networking, our Ed Team members (Eleni Katsoulas, Theresa Suart and I) also roam the poster aisles (we greedily snap up the mini versions), chat with people at the booths (hello CMPA Good Practice Modules, and MedicAlert Bracelet Free Curriculum! ), and divide up and conquer when it comes to attending moderated poster, oral and workshop sessions. That means we’re synthesizing all this knowledge and bringing it home for everyone here—and do we have some terrific ideas! Kudos to the many Queen’s faculty, staff and students who gave oral presentations, poster presentations and workshops! One reason we come to conferences is to celebrate this scholarship and efforts of our educational community. So it’s a real pleasure to celebrate and congratulate Paxton Bach, Meds 2013, on being awarded the Sandra Banner Student Award for Leadership. This prestigious award from the Canadian Resident Matching Service (CaRMS), consists of up to $5,000 annually to be given to a medical student or resident who demonstrates an interest in or an aptitude for leadership among their peers. Congratulations Paxton! 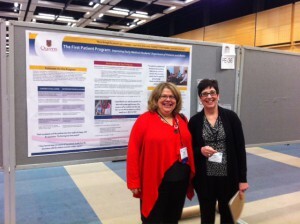 And here, Kathy Bowes and I are standing in front of our poster (with Tony Sanfilippo) about the First Patient Program telling the world (well some of it) that Queen’s is the first Canadian medical school to bring this kind of longitudinal learning from patients to years 1 and 2 students in medical education. This was a great idea Tony Sanfilippo brought back from an AAMC conference two years ago. I wonder what great ideas he’ll be bringing back from this conference! Here is a sample of faculty from U of T and Ottawa U tweets to Eve. Ben continues, “One highlight for me was a fascinating presentation on Hidden Curriculum by a PGY-4 from McGill. She was exploring factors and common experiences amongst clerks that lead to hostile learning environments. She was very clearly advocating for medical students and progressive medical education, and it was inspiring to see another resident speak up at the end of the talk to lend his full support as well. I think residents are in a uniquely favourable position to mediate and collaborate between medical students and attending physicians and it was terrific to see these residents take up this important cause. I entitled this blog, “Why go to conferences?” They are a lot of hard work, a lot of travel, long hours, and a lot of time away from home, family and work. But they also mean a great deal of learning about the best and latest in our fields, great ideas for helping our students, the ability to peer forward into the future, new people to connect and work with, a chance to do some thinking, a chance to drink in knowledge, and a chance to celebrate scholarship from our own institution as well as inhale that from others. Don’t take my word for this! Go into Twitter and see the scope of the learning that went on at #CCME13. Next CCME is in Ottawa—see you there! My thanks to Eve Purdy for most of the photos and the comments, Ben Frid for the CFMS Delegates’ photo and comments, Dr. Jalali for the twitter photo of Dr. Courneya and her poster, Theresa Suart and Eleni Katsoulas for the company and the great quotes, and Dr. Sanfilippo for sending us here! Do you have any CCME 13 experiences to share? Post them here! 5 thoughts on "Why go to conferences?" Sounds like this was an incredible conference! Sorry I couldn’t be there. You were very much missed, Ted! That rice pudding was delicious! 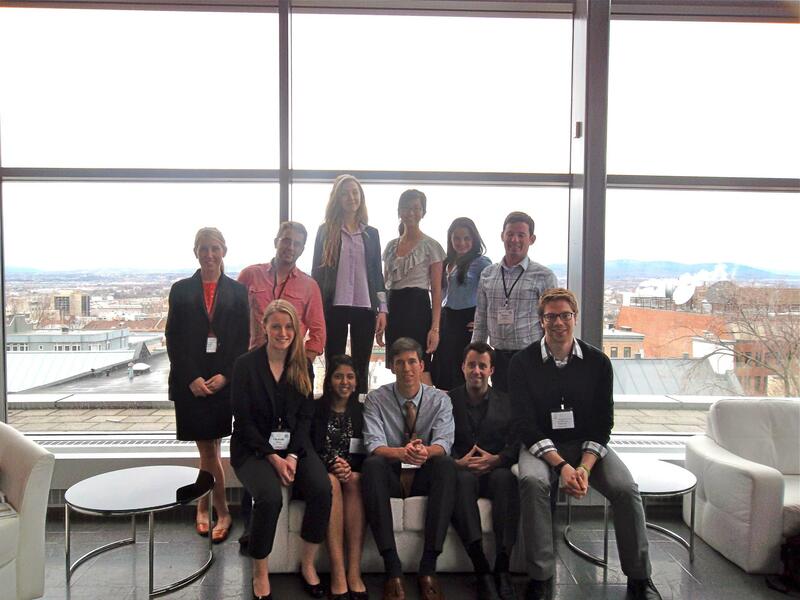 In seriousness though, what a great conference! Amazing opportunity to meet future colleagues. We can think of the rice pudding as a metaphor for the conference–delicious, nourishing, and slightly different in presentation! thanks James! What an amazing experience to catch up with old friends from Queen’s at CCME, and also to meet up with so many energetic students and staff at the Dean’s reception. Cha gheill! Next PostNext How could I have forgotten Medical Humanities?